European earth weather satellite. Meteorology satellite built by Aerospatiale for ESA => EUMETSAT, Europe. Launched 1977 - 1997. AKA: MOP;MTP. Status: Operational 1977. First Launch: 1977-11-23. Last Launch: 1997-09-02. Number: 7 . Gross mass: 692 kg (1,525 lb). European Space Agency weather satellites with the primary goal to provide visible and IR day/night cloud cover data and radiance and disseminate image data to users through the Data Collection Platform (DCP). Operational geostationary Meteosat satellites followed 3 pre-operational versions (Meteosat-1,-2,-3/P2). Meteosats had a 2.1 m diameter, 3.195 m high stepped cylindrical body with solar cells on six main body panels. The spacecraft was spin-stabilized at 100 rpm around the main axis aligned almost parallel to the Earth's axis with spin regulated by two small hydrazine thrusters. Spin access control and east-west station-keeping was provided by two pairs of large thrusters. Attitude information was provided by Earth horizon and Sun-lit sensors. A radiating dipole antenna directed S-band (333 kbs) transmission of DCP image data to the Data Acquisition, Telemetry, and Tracking Station at Odenwald, Germany for relay to the Meteosat Ground Computer System and Meteosat Operations Control center at ESA's European Space Operations Centre (ESOC). The Meteosats carried a single imaging radiometer in visible/infrared wavelengths in addition to the Data Collection Platform. Family: Earth, Earth weathersat, Geosynchronous orbit. Country: Europe. Engines: Mage 1. Launch Vehicles: Thor, Delta, Ariane 1, Delta 2914, Ariane, Ariane 44LP, Delta 2000. Launch Sites: Cape Canaveral, Cape Canaveral LC17A, Kourou, Kourou ELA1, Kourou ELA2. Agency: ESA. Bibliography: 2, 3957, 4, 6, 6703, 12830. 1977 November 23 - . 01:35 GMT - . Launch Site: Cape Canaveral. Launch Complex: Cape Canaveral LC17A. LV Family: Thor. Launch Vehicle: Delta 2914. Meteosat 1 - . Mass: 697 kg (1,536 lb). Nation: Europe. Agency: ESA. Class: Earth. Type: Weather satellite. Spacecraft: Meteosat. Completed Operations Date: 1985-06-01 . USAF Sat Cat: 10489 . COSPAR: 1977-108A. Apogee: 35,854 km (22,278 mi). Perigee: 35,777 km (22,230 mi). Inclination: 11.90 deg. Period: 1,437.60 min. European Space Agency satellite. Launch time 0135 GMT. Reached definitive position, 0 deg longitude over the Gulf of Guinea, on 7 December. Launched by United States Delta rocket. Positioned in geosynchronous orbit over the Atlantic Ocean at E-4 deg W in 1977-1981; 8E-12 deg E in 1981-1984; 2E-6 deg E in 1984-1985 As of 29 August 2001 located at 51.23 deg E drifting at 0.354 deg E per day. As of 2007 Mar 3 located at 11.52E drifting at 0.055W degrees per day. 1981 June 19 - . 12:32 GMT - . Launch Site: Kourou. Launch Complex: Kourou ELA1. LV Family: Ariane. Launch Vehicle: Ariane 1. Meteosat 2 - . Mass: 697 kg (1,536 lb). Nation: Europe. Agency: ESA. Class: Earth. Type: Weather satellite. Spacecraft: Meteosat. Completed Operations Date: 1991-12-04 . USAF Sat Cat: 12544 . COSPAR: 1981-057A. Apogee: 36,329 km (22,573 mi). Perigee: 36,124 km (22,446 mi). Inclination: 11.10 deg. Period: 1,458.60 min. Meteosat 2 is a geostationary meteorological satellite, operating within the world wide network of the World Weather Watch of WMO. Its main missions are: Imaging in the visible, IR and water vapour region of the spectrum; data reception from so-called dat a collection platforms (DCPs); data distribution to meteorological services and other interested parties (research institutes etc). Launch time 1233:03 UT. Geostationary position 0 deg E. Designator ESA/81/03. As of 3 September 2001 located at 58.52 deg W drifting at 5.577 deg W per day. As of 2007 Mar 10 located at 125.67W drifting at 5.583W degrees per day. 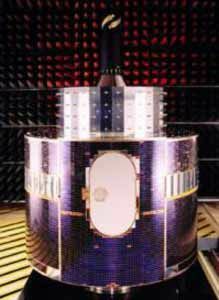 Meteosat 3 - . Mass: 696 kg (1,534 lb). Nation: Europe. Agency: Eumetsat. Class: Earth. Type: Weather satellite. Spacecraft: Meteosat. Completed Operations Date: 1995-11-22 . USAF Sat Cat: 19215 . COSPAR: 1988-051A. Apogee: 36,766 km (22,845 mi). Perigee: 36,723 km (22,818 mi). Inclination: 7.50 deg. Period: 1,485.30 min. Stationed at 0 deg. Meteosat P2 is a geostationary meteorological satellite operating within the world wide network of the World Weather Watch of the World Meteorological Organization. Its main missions are: Imaging in the visible, IR and water vapour region of the spectrum; data reception from so-called Data Collection Platforms (DCPs); data distribution to meteorological services and other interested parties (research institutes, etc). Geostationary position 0 deg E. ESA designator ESA/88/02. Launch time 1119:33 UT. Positioned in geosynchronous orbit at 1 deg E in 1988-1989; 49 deg W in 1989; 4 deg W in 1990-1991; 49 deg W in 1991-1993; 75 deg W in 1993-1995; 70 deg W in 1995 As of 5 September 2001 located at 175.17 deg W drifting at 11.970 deg W per day. As of 2007 Mar 11 located at 140.75W drifting at 11.975W degrees per day. 1989 March 6 - . 23:29 GMT - . Launch Site: Kourou. Launch Complex: Kourou ELA2. LV Family: Ariane. Launch Vehicle: Ariane 44LP. Meteosat 4 - . Payload: MOP 1. Mass: 681 kg (1,501 lb). Nation: Europe. Agency: Eumetsat. Class: Earth. Type: Weather satellite. Spacecraft: Meteosat. Completed Operations Date: 1995-11-08 . USAF Sat Cat: 19876 . COSPAR: 1989-020B. Apogee: 36,795 km (22,863 mi). Perigee: 36,600 km (22,700 mi). Inclination: 6.50 deg. Period: 1,482.90 min. Meteosat Operational Program; weather imaging, atmospheric data; 0 deg. Geostationary meteorological satellite, operating within the world-wide network of the World Weather Watch of the World Meteorological Organization (WMO). Its main missions are: imaging in the visible, infrared and water vapour region of the spectrum. Dat a reception from so called Data Collection Platforms (DCPs); data distribution to meteorological services and other interested parties (research institutes, etc). As of 4 September 2001 located at 98.34 deg W drifting at 11.393 deg W per day. As of 2007 Mar 10 located at 21.37E drifting at 11.390W degrees per day. 1991 March 2 - . 23:36 GMT - . Launch Site: Kourou. Launch Complex: Kourou ELA2. LV Family: Ariane. Launch Vehicle: Ariane 44LP. Meteosat 5 - . Payload: MOP 2. Mass: 681 kg (1,501 lb). Nation: Europe. Agency: ESA. Class: Earth. Type: Weather satellite. Spacecraft: Meteosat. USAF Sat Cat: 21140 . COSPAR: 1991-015B. Apogee: 35,765 km (22,223 mi). Perigee: 35,758 km (22,218 mi). Inclination: 0.30 deg. Period: 1,434.90 min. Earth imaging for weather, climatology, atmospheric physics; 4 deg E. Geostationary meteorological satellite, operating within the world-wide network of the World Weather Watch of the World Meteorological Organization (WMO). Its main missions are: imaging in the visible, infrared and water vapour region of the spectrum. Dat a reception from so called Data Collection Platforms (DCPs); data distribution to meteorological services and other interested parties (research institutes, etc). Launch time 2336:00 UT. Positioned in geosynchronous orbit at 4 deg W in 1991; 1 deg W in 1991; 4 deg W in 1991-1992; 1 deg W in 1992; 8 deg W in 1993-1997; 9 deg W in 1997-1998; 63 deg E in 1998-1999 As of 5 September 2001 located at 62.77 deg E drifting at 0.000 deg E per day. As of 2007 Mar 1 located at 63.15E drifting at 0.006E degrees per day. 1993 November 20 - . 01:17 GMT - . Launch Site: Kourou. Launch Complex: Kourou ELA2. LV Family: Ariane. Launch Vehicle: Ariane 44LP. Meteosat 6 - . Payload: MOP 3. Mass: 704 kg (1,552 lb). Nation: Europe. Agency: ESA. Class: Earth. Type: Weather satellite. Spacecraft: Meteosat. USAF Sat Cat: 22912 . COSPAR: 1993-073B. Apogee: 35,796 km (22,242 mi). Perigee: 35,776 km (22,230 mi). Inclination: 2.10 deg. Period: 1,436.10 min. Stationed at 0 deg. Positioned in geosynchronous orbit at 10 deg W in 1994-1997; deg W in 1997-1998; 9 deg W in 1998-1999 As of 4 September 2001 located at 9.14 deg W drifting at 0.012 deg W per day. As of 2007 Mar 11 located at 36.89E drifting at 0.610E degrees per day. 1997 September 2 - . 22:21 GMT - . Launch Site: Kourou. Launch Complex: Kourou ELA2. LV Family: Ariane. Launch Vehicle: Ariane 44LP. Meteosat 7 - . Payload: MTP 1. Mass: 692 kg (1,525 lb). Nation: Europe. Agency: Eumetsat. Manufacturer: Cannes. Class: Earth. Type: Weather satellite. Spacecraft: Meteosat. USAF Sat Cat: 24932 . COSPAR: 1997-049B. Apogee: 35,791 km (22,239 mi). Perigee: 35,779 km (22,231 mi). Inclination: 0.40 deg. Period: 1,436.00 min. Geosynchronous. Stationed over 10.2W Positioned in geosynchronous orbit at 10 deg W in 1997-1998; deg E in 1998-1999 As of 5 September 2001 located at 0.68 deg E drifting at 0.036 deg W per day. As of 2007 Mar 11 located at 57.39E drifting at 0.007W degrees per day.